We can only fully understand the Cathedral of Santiago by entering the doors of its valuable museum. Touring the museum has the charm of an exciting journey through time, because it combines admirable architectural spaces (which cannot otherwise be contemplated, such as the cloister and crypt) and thousands of objects from the city’s Roman past, the first pilgrimages, basilicas that no longer exist and treasures accumulated by the Cathedral during almost one thousand years of existence. The museum started in 1930, as a result of the excavations carried out in the very heart of the basilica from the 19th c. onwards. That historic foray into the subsoil revealed layers and layers of human burials, along with the plinths of previous churches. All of this has been brought together in fives spaces, whose exhibits now range from relics of saints from all over Christendom to the tombs of kings, tombstones and tapestries, altarpieces and coins, unrepeatable books and two big attractions: Maestro Mateo’s Stone Choir and the well-known “Botafumeiro” censer. Crypt (accessed via Plaza del Obradoiro). The Romanesque crypt opens up behind the double stairway of the Obradoiro façade. Inside it is like a miniature church, whose sanctuary is reminiscent of the Cathedral’s original one. 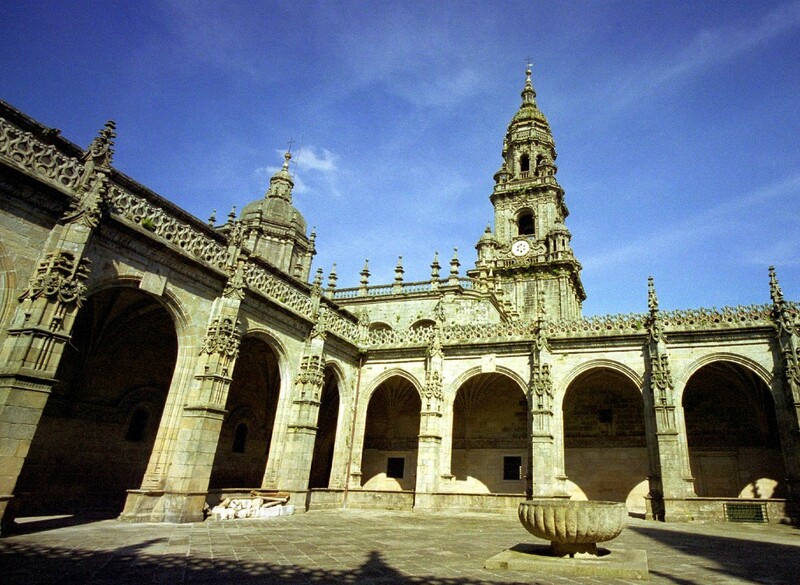 The most striking features are the sturdy central columns, one of which supports the weight of the “Pórtico de la Gloria” mullion and the other that of the Obradoiro façade; and the rich decoration on its capitals, many of which were sculpted by Mateo’s workshop. Its impressive ribbed vault is probably the first of its kind to be built in Spain. Since the crypt is a symbolic depiction of the Earth at the feet of the Portico’s Christ, its vault evokes the firmament and features, while its keystones feature two angels bearing the Sun and the Moon. This empty space is used to exhibit, in display cabinets, a reproduction of the instruments that the elders are playing in the “Pórtico de la Gloria,” as well as Romanesque and Gothic objects that used to form part of the Cathedral. Cloister (accessed from the Chapel of Relics or from Plaza del Obradoiro). The Gothic-Renaissance crypt is accessed from Plaza del Obradoiro via a ground floor with archaeological rooms that overcomes the difference in ground level, since the cloister itself is located on the first floor compared to the square. These rooms exhibit discoveries from the excavations carried out in the apostle’s tomb and below the Cathedral, which uncovered remains from the Roman past and pre-Romanesque basilicas. In the rooms devoted to the Romanesque period, apart from an overview of the construction of the present-day Cathedral, it is worth mentioning a section in situ of the old Rúa de Valladares street, which has been preserved the way it was in the 15th c. alongside the previous Romanesque cloister. What stands out the most is the partial reconstruction of Maestro Mateo’s stone choir, which occupied, from the 13th to the 16th c., the Cathedral’s central nave. The only one of its kind in all Europe, it was made up of upper and lower stalls for the canons’ worship and prayers, with an exterior façade depicting the Apocalyptic vision of Heavenly Jerusalem. The mezzanine rooms are devoted to art from the 13th to 18th c., with sculptures, paintings, fabrics and an interesting medieval coin collection, which includes both coins brought by pilgrims from many European countries and coins minted in Santiago by royal privilege. Continuing our way up, we see the 16th-c. Renaissance cloister built by Juan de Álava, Gil de Hontañón, Juan de Herrera and Gaspar de Arce. The interior is in the plateresque style. Its four large wings feature a magnificent star-shaped vault, beautiful cresting and, on the ground, tombstones of canons. On this same floor there is the Chapel of El Alba and the archive (not included in the tour), which houses gems such as the Codex Calixtinus and the Cathedral’s “Tumbo A” and “Tumbo B” documents. In the cloister’s central area we can see old bells that have been removed from the Clock Tower, including the original “Berenguela,” which is noticeably cracked. In the centre is the Fons Mirabilis, a granite Romanesque fountain that used to be located at the church’s north entrance, the Door of Paradise. The tour continues in the Chapter House, with its beautiful granite baroque vault, an altarpiece of St. James the Pilgrim (Gambino, 1754), pieces of rococo furniture and Flemish tapestries; and the Library, which in addition to valuable volumes and incunabula, houses the famous “Botafumeiro” censer (when it is not being used on special occasions). Completing the cloister building, on the top floor, is the collection of tapestries from the 16th to the 18th c., the most outstanding of which are those designed by Rubens featuring mythological themes; by Goya, with themes of local customs from the 18th c, or by the Royal Factory of Santa Bárbara, inspired by paintings by David Teniers. From the top-floor balcony, there is a view of the entire Plaza del Obradoiro, city roofs and nearby hills. Chapel of Relics, Royal Pantheon and Treasury (accessed from inside the Cathedral). Behind the beautiful Renaissance portal, the Chapel of Relics (formerly the chapterhouse in the 16th century) houses sacred donations from all over the world, by pilgrims, kings and bishops during the basilica’s almost one thousand years of history. They are exhibited in the magnificent Lebanon-cedar altarpiece (Maximino Magariños, 1924). Here it is worth mentioning the Caput Argenteum, a 14th-century reliquary-bust that houses the skull of St. James Alphaeus, an apostle and cousin of Jesus, brought to Santiago by Pope Gregory VIII in the 12th c.
The Royal Pantheon displays tombs and reclining statues of kings of Galicia and León that died in the 12th to 14th c.: Fernando II of León, Alfonso IX ((VIII of Galicia), the queen Doña Berenguela (wife of Alfonso VII), Doña Juana de Castro (wife of Peter the Cruel) and Raymond of Burgundy, niece of Pope Callixtus II and son-in-law of Alfonso VI, among others. The Treasury, in the Chapel of San Fernando, features a large collection of liturgical articles from the 11th to 20th c., with objects made of gold and silver, precious stones, ivory and glass.